More Superman news this week. The cover of the latest edition of Action Comics has stirred up a minor controversy on the DC Forums. 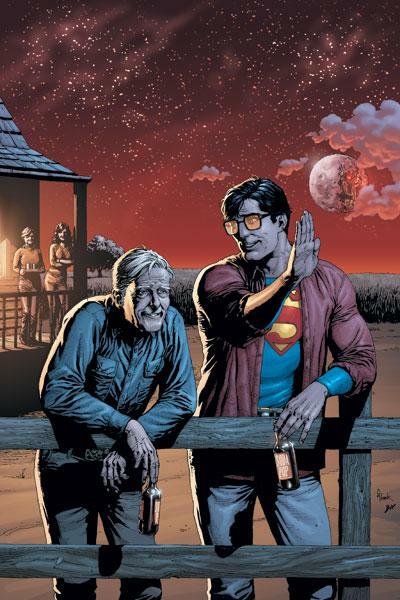 Looks like the issue has been recalled because of its depiction of Clark Kent having a cold one with his old man. Evidently copies of the issue with the offending image were recalled as DC was afraid of the adverse effects it would have for kids to see big blue knocking back a cold one. Personally, I think it would be out of character for a character who frowned on Lois Lane smoking in the first Christopher Reeve movie to be shown drinking beer. Dc has countered with an alternate cover (seen here) which has been redrawn with a generic soda pop label. Maybe Supes was driking root beer all along?? I was more disturbed by the annoying way in which the artist is going out of his way to make it a photo realistic style and portraying Superman to look more like Christopher Reeve. I understand this is his way of honoring his memory, but it really takes me out of the issue. I read comic mostly for escapism and I don’t want to be reminded of real life people, living or otherwise. I wish Action Comics would stop this practice. This entry was posted on Thursday, September 18th, 2008 at 10:57 pm and is filed under Uncategorized. You can follow any responses to this entry through the RSS 2.0 feed. You can leave a response, or trackback from your own site. 5 Responses to Superman drinks beer? I think his glasses are weird like the joke kind that make your eyes look sad and droopy. Who are the people in the back? His mom and Lois? They pulled this? Interesting; this is the copy I have.